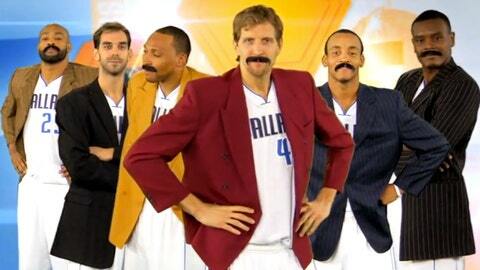 The Dallas Mavericks took a little time off from playing to have a little fun, Anchorman style. As if you didn’t get enough Anchorman 2 promotions over the past couple of months, the Dallas Mavericks took their turn to have a little fun. In yet another hilarious video released by the Mavs, Dirk Nowitzki, Shawn Marion, Vince Carter, Jose Calderon, Monta Ellis and Samuel Dalembert all donned their 70s blazers and mustaches to entertain Mavericks fans. Well, except Calderon. His own facial hair was enough. Each player of the ‘Starting 5’ news team had a speciality, including Ellis as the movie reviewer and Calderon as the foreign correspondent. Argueably the best line in the video belongs to Dalembert the weather man. "I don’t know what you’ve heard, but the weather is fine up here," he says. And of course Dirk Nowitzki is Ron Burgundy, because, you know, he’s kind of a big deal.